BEIJING - The Standing Committee of the Political Bureau of the Communist Party of China (CPC) Central Committee, the Party's top leadership, held a meeting here on Thursday and called for the prevention of epidemics and the minimization of losses in the quake areas. The Party leadership ordered rescuers to search for trapped people in every village, to ensure that no one was left behind, and try hard to cure all injured people, in order to "save as many lives as possible." 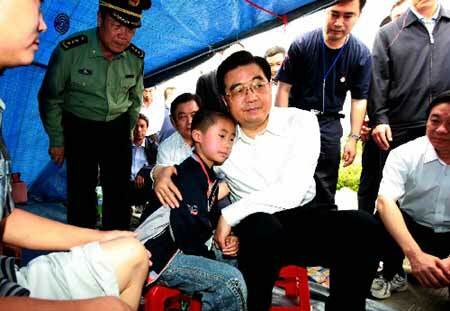 Chinese President and General Secretary of the CPC Central Committee Hu Jintao presided over the meeting, which heard a report by the State Council's General Headquarters for the Earthquake Relief. According to the State Council (cabinet) report, since the earthquake occurred in Wenchuan County, Sichuan and neighboring regions, on May 12, the armed forces, the police, medical workers, journalists, scientists, and people of all circles have been working together with the affected people and support from different institutions and sectors at home, overseas Chinese and the international community. The cabinet said that major progress had been made in the relief work, which has laid a solid foundation for the final victory of earthquake relief. At the meeting, the Party leadership came to a conclusion that the current anti-earthquake campaign still faced a serious situation and the relief job was enormously tough. It ordered shipments of more food, water, clothing and bedding, as well as tents and makeshift housing, to the quake areas. Repair quake-damaged infrastructure facilities and pay special attention to reservoirs, power stations and quake lakes, it said. The Party leadership also urged local authorities to maintain social stability and stabilize people in the affected areas, help local farmers to harvest and plant crops to restore agricultural production, and help students to go back to school as soon as possible. All localities and central departments must follow the arrangements of the central authorities, by on one hand working on the earthquake relief and on the other, maintaining economic and social development, according to the meeting. It called for going all out to support the affected areas and working hard to maintain steady, relatively fast economic development and social harmony and stability.